most interesting tours in Korea. De Militarized Zone: Most interesting tourist spot for all types of travellers and even for the locals in South Korea. Various organizations offer tours around DMZ area, But our DMZ Tours will provide you best experience. This is the what our tour guide say ! My name is Amy Yang, a tour guide for DMZ Tour. DMZ tour is the most popular tour because it is the only chance for you to go very close to the border between two Koreas. Don’t you want to go inside the infiltration tunnel made by North Korea? Also, you can see North Korean territory through binoculars at the observatory. For those of you who have no idea about what DMZ is and why Korea is divided into North and South, I’ll fill up your brain with lots of information about Korea during the tour program. In addition, I’ll explain about not only Korean history but also some recent issues that are going on in two Koreas. If you make a reservation with our company, DMZ TOURS, I promise that I will make your trip unforgettable with well-organized tour! I can’t wait to take you to DMZ tour and see you enjoying new experience there. Thank you! As everyone know the Korea is only divided country in the world, and while we are looking for the reunification, this would be the last chance you to visit the DMZ area. On April 27, 2018, an inter-Korean summit meeting was held at ‘the Peace House’ of Panmunjom. It was a meeting which took place 11 years after the inter-Korean summit in 2007. All the previous inter-Korean summits used to hold in Pyong - yang, but the 2018 summit was held for the first time in the southern part of Panmunjom's House of Peace. The JSA is located 48km northwest of Seoul, South Korea and 10km east of Gaesong, North Korea. 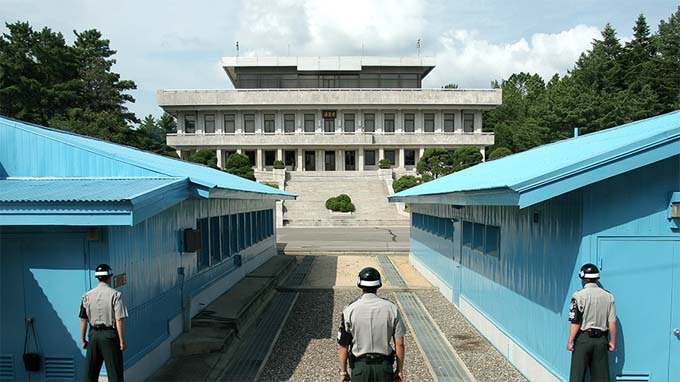 After concluding a Truce Agreement in 1953, it was decided to be a Joint Security Area between UN and North Korea. It is a small space where the distance between the front, rear and right and left guards is only 800 meters. In 1950, there were only a few straw houses in the village before 25th of June. The truce talks between 1951 and 1953 were held, and it was known all over the world. The truce talks, which began with a tent for the first time, were held for a year and nine months. After the truce talks were over, a wooden building was built in the vicinity to sign the truce agreement. Then, it moved in present place. After The Truce Agreement was signed here in July 1953, it became a "Joint Security Area" between the United Nations and North Korea. From August to September of the same year, prisoners were exchanged for one month. Panmunjeom was mainly used as a place to manage the truce. The North-South Red Cross Preliminary Talks, held on 20th of September,1971, has been used not only as a venue for The Military Armistice Commission, but also as a place for contact and talks between North and South Korea and as a transit point between the two Koreas. Within the Joint Security Area, there are the main conference hall of the Military Armistice Commission and the conference room of the Neutral Nations Commission of Supervision. The Military Demarcation Line indicates Mike line that is passing through the middle of a conference table set up in the conference room of The Military Armistice Commission. The U.N. and North Korean flags on the table are also symbols of Military Demarcation Line. In addition, there is a bridge called ‘Unreturned Bridge’ that symbolizes the division of people in the west of Panmunjom. This is the name of prisoners of war exchanged through the bridge since the 1953 Truce Agreement. However, the bridge was closed due to "The Axe Murder Incident". In August 1976, two U.S. military officers were killed with axe by North Korea soldiers in the Panmunjeom Joint Security Area. In this incident, a Military Demarcation Line was set up within the JSA. Now The Joint Security Area is safer and more peaceful than you think. Our guide of ‘DMZ TOURS’ should provide an easy and detailed account of the history from June 5, 1950 when the Korean War started to April 2018 when the inter-Korean summit was held. After pain of the division, truce talk has been held between South Korea and North Korea on 1951, at the meeting we both decided to rest from the war and finally reached to the agreement of setting up the Military Demarcation Line between South and North. The Military Demarcation Line constructed to 2km away from North and South each, total of 4km between Korea. Due to the strong restriction of DMZ area, there was no access of any civilian for 40years and managed by Military Community, since there was no access of human for 40years, the place became an ecological preservation area. With our DMZ Tours , you will able to visit the Dora – Observatory ,where you can view most beautiful nature of Korea and you will actually experience of walking into 3rd Infiltration Tunnel(1.0mile long) to see how North Korea tried to sneaky into South Korea after the peace settlement. Also you will stop by Imjingak to find out the story of pain of division with our experienced guide. This is the what our tour guide say! Welcome to Korea! I’m Alice one of the English speaking tour guides at DMZ TOURS. I’m looking forward to meet you, and hope I can make your stay as comfortable and memorable as possible. Whether you would like to visit the DMZ and gaze eyes on mysterious North Korea, or indulge in Korea’s food, culutre, or beautiful landscape, I will do my best to provide the perfect balance between history and fun to suit you, or your group’s needs. As an avid traveller myself, having visited over 40 countries, I’m delighted to show you the best my country has to offer. So book a tour with me, by contacting DMZ TOURS! COPYRIGHT © 2011-2020. DMZTOURS.COM All rights reserved.